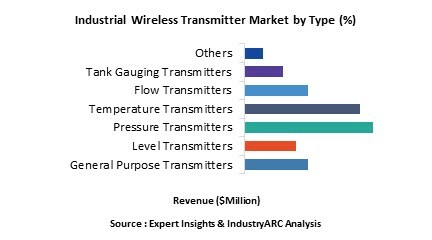 Industrial wireless transmitters is valued $2327 million in the year 2017 and is expected to grow at a CAGR of 9.37% from the year 2018-2023. Pressure transmitter which is a type of transmitter is the leading transmitter with revenue of 557$ million in the year 2017 and is expected to grow at a CAGR of 8.47% from the year 2018-2023 which is followed by temperature transmitters which is valued $507 million in the year 2017 and is expected to reach a CAGR of 8.47% between 2018-2023. What is Industrial Wireless Transmitters? Wireless transmitter is a technology used to communicate information about the system to an area where the information cannot be sent electrically. The wireless transmitter works with the help of a device which is attached to a control panel from where the signals are sent. These transmitters are also provided with receivers which can read information. Industrial wireless transmitters are segmented based on the type, transmission range and medium. Embedded vision system is being used in many industries which is incorporated in the cameras. This vision system is programmed to perform defined tasks using infrared and 3D thermal cameras to inspect and monitor the inventory system. This 3D cameras are used for industrial inspection which can also reduce the costs. EtherCAT is a field bus technology which is a connecting device that works with many automation applications. EtherCAT is a device used to read the data without copying the information. A new inventory management system which is SystemOn which consists of a microphone connected to the transmitters which monitor the staff and also inventory in the company and sends an alert message to the person if there is any problem in the inventory management system. Who are the Major Players in Stair Lift market? The companies referred in the market research report includes Stannah Stairlifts Ltd, Acorn Stairlifts, ThyssenKrupp AG, Bruno Independent Living Aids, Platinum Stair lifts Ltd, Harmar, Handicare Group AB, Otolift Staitlifts Ltd.